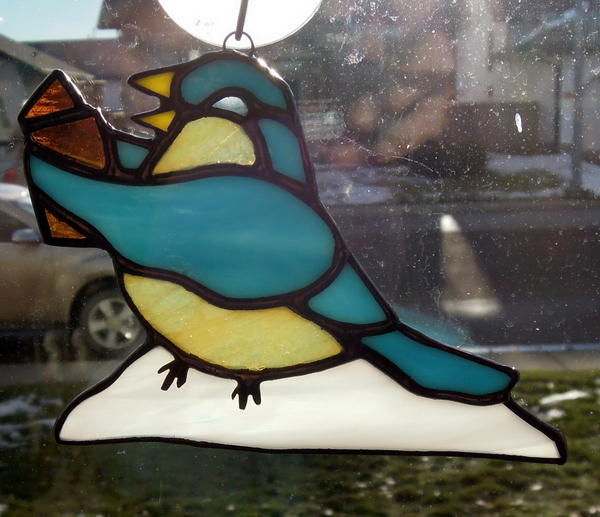 We just made this Blue Bird Caroler which is for sale along with other Christmas items at the White Raven Emporium in Didsbury Alberta. This would certainly brighten and add to your Christmas decorations. It is small enough that it could also be used as a Christmas Tree ornament. 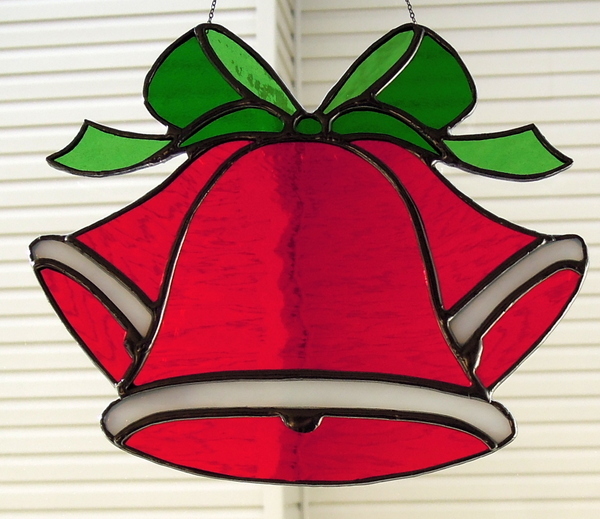 We used Spectrum’s Red Waterglass for these Christmas Bells. They add a wonderful touch to your Christmas window decorations. 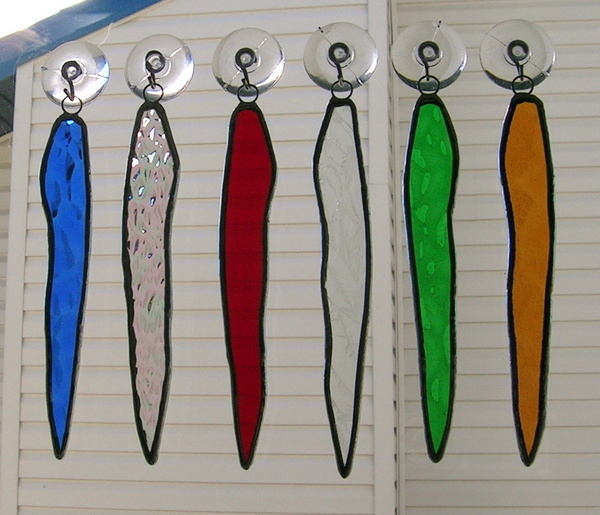 We started making these icicles many years ago in the various colors shown. They reflect the lights of your Christmas Tree, they measure about 4.5 inches long. The most popular one is the 2nd from the left which is made with Spectrum’s Clear Crystal Ice Iridescent glass which adds a wow factor to your Christmas Tree Decorations. 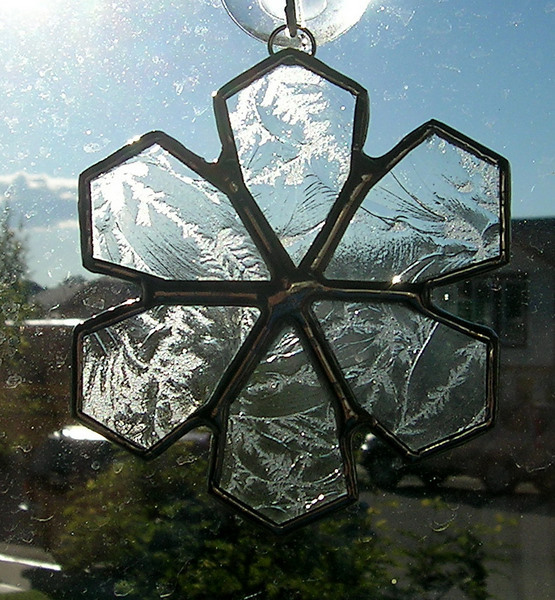 We started making snowflakes in 2008 when a client asked for stained glass snowflakes to add to their Christmas Tree. By using Glue Chip glass it made a great frosted looking snowflake. They make a beautiful addition to ones Christmas Tree decorations and shine in the lights from your tree. We reduced the design so they are approximately 2.75 inches in diameter and easily hang on your tree, using ornament hangers. We made this for a client as a Christmas Gift in 2008. 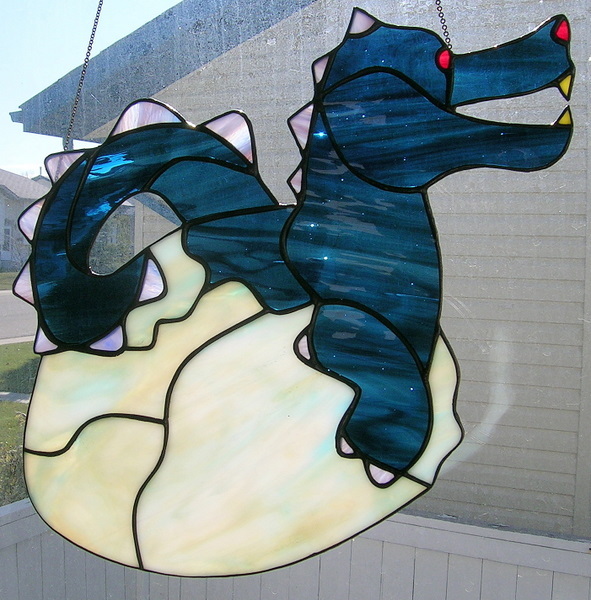 It is a very neat design as is shows a baby dragon hatching from it’s shell. This design was on one of the pattern disks that Paned Expression Studios Inc. sell and their design work is simply outstanding.